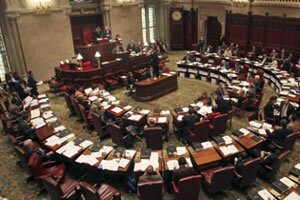 A bill that sought to prohibit transgender discrimination died in New York as the legislative session came to a close Thursday night. The Gender Expression Nondiscrimination Act (GENDA) would have added transgender people to New York's hate crimes law and protected them from discrimination in the areas of employment, housing and accommodations. While the Assembly has approved the bill 8 times since it was first introduced 12 years ago – most recently earlier this month – and Governor Andrew Cuomo has pledged his signature, the New York Senate has yet to vote on GENDA. Groups lobbying for passage, including HRC, Empire State Pride Agenda and the NY Trans Rights Coalition, held a press conference earlier this month calling on the Senate to act. “It is time for the Senate to stop blocking the measure and for Senate President John Flanagan … to bring GENDA up for a vote before the end of the session,” HRC said in a blog post. Nineteen states have approved similar legislation.